DAILEKH, June 28: Two much-hyped drinking water projects of Dailekh-Majhuwa and Badalamji have failed to make any progress for the last decade. With the objective of supplying drinking water to the dense and dry settlements, the government has planned to spend Rs 190 millions for these two projects. But due to the negligence of the consumers committee and District Drinking Water and Sanitation Division Office (DDWSDO), these project haven't taken off for years. A year ago, office-bearers of the consumers committee vandalized the DDWSDO following the dilly-dallying. Bini Shahi, secretary of Majhuwa Consumers Committee, has been open about the commission game between the officials of consumers committee and DDWSDO. In fact, Shahi was the one who led the protests against the officials of DDWSDO accusing them of misappropriating funds meant for the projects. However, Bikash Kafle, chief of DDWSDO, Dailekh, stated that these controversial issues came out in public because of 'internal disagreements'. As per the consumers, these two projects have been nothing more than income sources for some people. The construction of Majhuwa Drinking Water Project (MDWP) kicked off in fiscal year 2009/10. 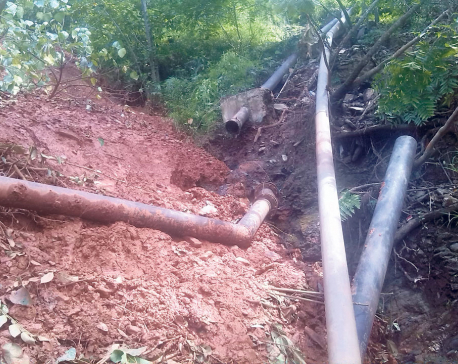 Chief of DDWSDO claims that the work is going on at good speed but the progress is not visible as they have been busy with the work of the source, reserve and the main pipe. He also claimed that they have been properly utilizing the budget provided by the government every year. Padam Bahadur Shahi, chairperson of Majhuwa Drinking Water Project accused DDWSDO of not furnishing the details of purchased pipes and other materials to the consumers committee. Currently, pipe laying work of MDWP is going on at full swing in Jammukandh. According to Chairperson Shahi, project officials have no idea about the cost and quality of construction materials as the division doesn't inform them about all this. So far, a total budget of Rs. 54 million has been spent in MDWP. But the total cost of the project was estimated to be around Rs. 93 millions. This project will be benefiting a total population of 8,400. Badalamji Drinking Water Project (BDWP) which kicked off in fiscal year 2008/9 purchased pipes only this year. Man Bahadur Thapa, chief of the project, said that the delay is because the technicians are yet to submit the financial cost of materials already purchased. He claimed that almost 60% of the project work has been completed. "It's been two years since I have been entrusted with this responsibility of project chief. Earlier, the project was completed only on paper but I will make sure that now it will be really completed," assured Thapa. Until now, a total budget of Rs 30 million has been spent on the project. The total cost of the project has been estimated to be Rs 101 million. This project aims to benefit 12,500 people.